We are Vermont's Fun and Professional Specialists in Event Entertainment and Artistic Services. If you've been to a large event or party in the Burlington area in the past 11 years, odds are you've seen us at work! Our expert face painting is the crown jewel of our services. Sean and Jana have over 20 years experience. You need face and body art at your next event! Face and Body Painting is consistently the most popular activity at any party or event. If you have a lot of people to paint, our HyperDrive airbrush face painting allows us to paint more faces per hour than any other face paint company in the state. 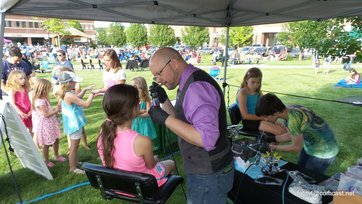 Our airbrush system also allows us to offer temporary tattoos, which makes us appealing to simply EVERYONE. We are taking on limited airbrush art commissions due to Sean's busy schedule. 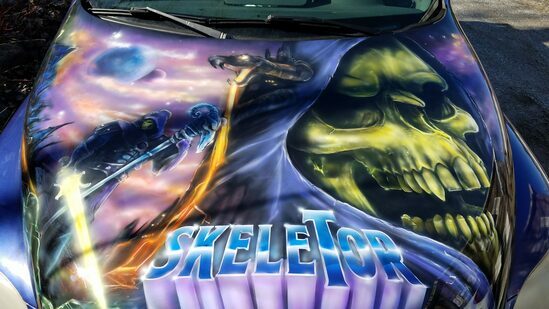 Please send along your airbrush art requests and we will let you know if we can accept it. Get ready for the next big thing! Sean and Jana have started their own face and body art bloggy magazine type thing. The first installment features a behind the scenes look at body painting photoshoots. Where do they come from? How are they put together and how can you get involved. It's an entertaining look at capturing the inevitably temporary body art. Here's why you should hire us! We paint the best looking faces in the shortest amount of time. Be the 1 billionth person to like us!